Tomorrows come and todays go and before too long what started out as an unavoidable down time, crisis only option (due to illness or injury) shifted to willful decision. I would stay home, watch a movie, play a video game, or scroll randomly through vintage footage of concerts, history documentaries, or scientific extrapolations on what, why, when, how, where, and who. To some, this is “doing something.” In regard to an end result or specific goal of actually accomplishing something – the highest score or fleeting knowledge of trivia – my “doing nothing” produces the same. Let me define my understanding of “doing nothing.” To me, doing nothing means that in place of doing something that can, should, or needs to be done, one simply does anything but. To the bold-faced seeker of meaning, the reality of doing the things described above, may in fact be “somethings” each and every one. Granted, doing nothing itself is actually doing something right? Do not discount the benefit of mindless distraction or enjoyable relaxation. One recipe of good heath is rest, exercise, and eating healthy. Volumes of data, debate, and proclamation stand ready to service your needs in these areas. But here is the problem with all this. Doing nothing in the sense of leaving unattended a wider and larger portion of life’s responsibilities soon becomes more than just chill time. It leads to crisis. Objects degrade, function declines, or conditions adapt to unsustainable proportions of endurance and stamina to perform basic tasks of life. Now things have become a mess. Just recently I used that phrase to describe the discovery of how to do something new with ease, “That was as easy as making a mess.” It stands to reason that the 2nd easiest thing to do, besides nothing, is make a mess. When weighing the outcomes of a given situation using the choice of doing nothing, compared to doing something with effort, hard work and attention, well, it is pretty obvious where the more positive resolution will exist. What healthy adult does not want a positive solution? Just look at the world today; look at the potential all around you for positive outcomes. Generalized in the world I bet there are millions of people going to bed every night hoping for just such a change. Yet how many are doing nothing? I once went to see a speaker with very well established charitable efforts already existing in the treatment of the sick and poor. He had founded a free hospital and named it Gesundheit. His question to the group of attendees was “What are you doing?” There is always something that can be done to help others. The basics of care for your loved one, friend, or client are detailed and offered for free. After reviewing the material Doulagivers™ provide, I eagerly joined and have become certified as a Level 3 Doula. Originally I had found this group by a desire to advance my own skills as an RN with end of life symptom management. Now I wish to share this knowledge in hopes of helping those who do not wish to allow the “mess” that “doing nothing” can create. 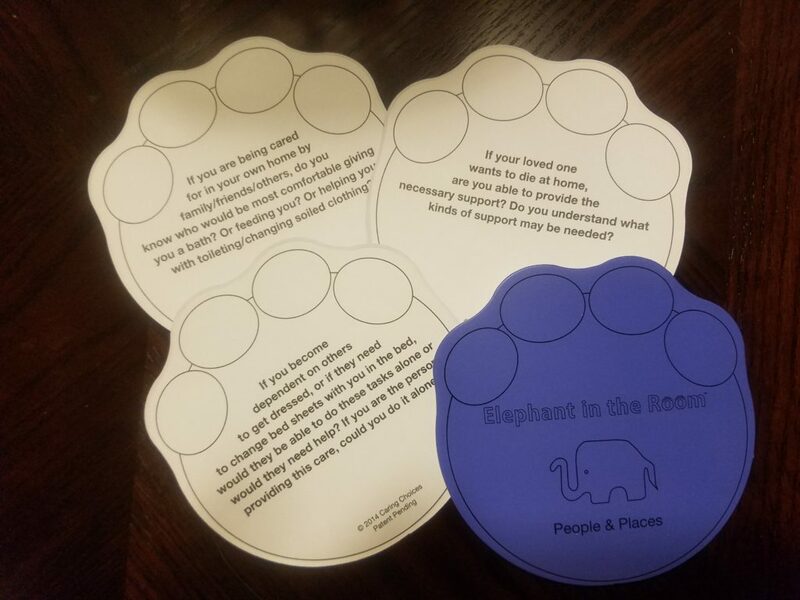 In addition to our Elephant in the Room conversation guide elephant-inthe-room.org caringchoices.org Caring Choices offers experience and compassion within the complexities of dealing with death. Don’t let “nothing” stand in your way. Hope for the best, prepare for the worst. Just think about it. Knowing you’re safe and accepted for your wishes can lessen anxiety and stress. Knowing everyone around you is prepared brings peace of mind and comfort. Appreciation of the love makes the loss more palpable and even visceral, but is life at its fullest when facing the unknown absence of it? We comfort each other our whole lives. This entry was posted in Advance Care Planning, Family Caregiving, Personal Stories, Resources on July 24, 2017 by James Desiderati. 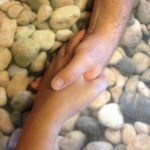 In my role as a hospice social worker, I have encountered patients who have an able and involved network of family and friends in caregiving roles. They are the fortunate few. More often than not, the situation is an elderly married couple whose children live in other states and who have a dwindling network of friends who are able to assist. Or, the patient is a middle-aged person who is riddled with cancer or an advanced illness needing 24/7 care and the only person available is their 20-something child or their spouse. No one person can provide 24/7 caregiving for very long. There’s no shame in admitting that help is needed; there’s no shame in accepting when help is offered. Much of the focus on end-of-life healthcare planning is centered on the patient’s choices. Caring Choices advocates strongly for patients to consider their options and discuss healthcare choices with their healthcare team and people they love. We also, however, advocate for meaningful conversations that encompass not only the healthcare choices but also the caregiving needs, the availability of options, and how those options will be financed. Depending on which article you ready, 75-90% of Americans wish to die in their own home. Dying in your home, for those who want that, can be a peaceful, comfortable end if there are adequate planning conversations long before the chronic illness progresses or the terminal diagnosis is pronounced. In order to remain at home through the end of life, you will need help. This is a fact that you need to wrap your brain around before you read further. YOU WILL NEED HELP whether you are the patient or the caregiver. My first recommendation is to look within your family/friend circles to find private duty caregivers. Typically, these are people you already know and trust. Some will supplement caregiving out of the goodness of their own heart; others may ask for (or you may offer) minimal remuneration ($10-18/hour). This is also the network who will most often provide meals, run errands, visit and provide some relief of the caregiving role. They key is to ASK them for the help you need; people don’t know until they’re asked. A second option is hiring caregivers privately through homecare agencies. These caregivers help provide care for yourself or your loved one at home in addition to enlisting hospice services. Many agencies provide in depth training on how to provide care from bathing/dressing to bedsore prevention and caring for people with dementia. Some agencies, however, do not provide much training. You want to be certain you are asking agencies about the training they give their staff. In our local area, these agencies typically charge between $22-25/hour depending on the level of care needed. That adds up to a lot of money pretty quickly. Embrace the elephant in the room. Start talking about healthcare choices, but also talk about who can provide caregiving assistance and when they are available to provide it. This entry was posted in Family Caregiving on April 30, 2017 by Cindy Moyer. At no other time in history have I been more aware that there is such a massive amount of uncomfortable conversations occurring. Sadly, much of the most offensive exchange we are currently exposed to is not verbal but texted, posted, printed, or pre-recorded. The convenience of these methods of information exchange is undeniable. The quality is questionable. The volume of discourse over the current political landscape is beyond comprehension, not only in America, but across the globe. The shifting sands of opinion and time will eventually settle, and new dialogue will resurface about whatever balance human existence regains. Having witnessed these tumultuous events, and recognizing the multitude of newly vehement revelers of political opinion which had never, before now, given the topic much consideration, I began to wonder: Why? Why now? Have there not been millions of debatable issues over the past 40 years that failed to become more than a C-Spanned, red-eyed, remote flip of boredom? Certainly we have all been affected by this shuffling of interests in world affairs both public and private. But in the past many of those personally involved were understandably limited to the professions directly designed to be appropriating the need. This political slugfest seems to have engaged everyone, from every perspective and every varied opinion into an extremely uncomfortable national discourse. Yet when attempts are made to encourage everyone to become involved with their own end of life issues, the resistance is equally universal. Very few people seem to want to begin discussions with a loved one; that is until an acute trauma or terminal diagnosis is ripping the lives of their family, friends, and acquaintances apart. As is common within proper social etiquette, there is a general outpouring of prayer, shared grief, and unified offers of support. What will it take to make this “uncomfortable” conversation as popular as the raging debates around the world today over truth, rights, and political control? It is every bit an undeniable fact that we have a new President as it is that everyone will eventually die. Life goes on, and ends; the disproportionate lack of acknowledgement of death will not change the fact that it will occur for all of us. What can help make conversations about death more comfortable? I believe it is honest, compassionate examination and understanding of the emotional, physical, and psychological needs of each other coupled with genuine, meaningful communication before a medical crisis occurs. Enough can never be said to help each other with what is often the most frightening, “uncomfortable” event we all will ever (and must) face. The outcome of these “uncomfortable” discussions may even be peace of mind, increased knowledge of legal and financial responsibility, understanding of desired preferences for services and care due to changed independence, emotional release, insight into unanswered concerns, repaired personal conflicts and family dynamics, expression of personal choice, acceptance of everyone’s opinion, etc. You will never know if you don’t ask. This entry was posted in Family Caregiving, News/Commentary, Personal Stories on January 31, 2017 by James Desiderati. My husband, Jim, and I have been on the receiving end of caring kneading from some of our cats over the years. Mercie (rest her soul) used to knead the back of my neck in bed at night which was especially welcome when I had a headache. The methodical push of her soft-padded paws accompanied by her melodic, low purring was better medicine than the ibuprofen I’d taken before going to bed. Just the other night when Jim wasn’t feeling well, Sundae seemed to sense this and kneaded his stomach in all directions with positive effect. We know others who have similar stories about the comfort and care they receive from their furry friends. It’s not difficult to find a story online about a cat in a nursing home who lays on the bed of a resident as they take their final breaths; or a dog that can sniff out cancer. Animals are so well connected to the metaphysical; they just seem to “know” when it’s time to provide comfort or time to let go. A few weeks ago, we chose to end the suffering of our oldest cat, Soxie, whose final seiz ure was so intense and vivid, she seemed possessed. It was horrifying to watch and hear; it will be a very long time before I can close my eyes and not see what she experienced. When she was able, she retreated to an odd location where she’d typically go when she wasn’t feeling well. She knew it was her time and she was “going inward” to prepare herself … and us. We humans are animals too; some would say more evolved than cats and dogs. Perhaps we’re more evolved in matters of business, literacy, art, and intelligence, but I’m not certain we are more emotional or more compassionate. Some people spend so much energy waiting for the other shoe to drop, we forget that there’s already one foot immersed in the disease and daily symptoms, or contemplating their final hours. This entry was posted in Family Caregiving, Personal Stories on January 22, 2017 by Cindy Moyer. Most people shy away from being around dying people. That seems to be a normal reaction. But, being around death – experiencing death of loved ones at home – used to be a very natural occurrence in American households. Before we “medicalized” dying and death, people were cared for at home by family and friends. There was an inherent knowledge about caring for aging, ailing, and/or elderly family members as they reached their final months, days, and hours. More than 80% of Americans say they want to die at home yet fewer than 25% of us actually do that. This disparity is likely because we’re rushed to the hospital by ambulance after panicked 911 calls, or we’re involved in a traumatic accident and traverse the ER-to-ICU pathway, or because palliative and hospice care are discussed/started much too late in a disease’s process. 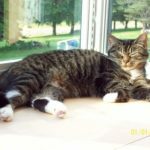 Caring for a dying loved one at home is challenging and, as I’ve shared in this blog previously, very rewarding. Beyond the demands of providing actual care (bathing, dressing, feeding, toileting, medication management, etc. ), there is also the emotional experience of caring for and watching someone you love fade away. It’s this emotional state that I want to address. I was once witness to a family caregiver’s phone call from a friend. I could see the happy anticipation in her face as the caller expressed desire to come by for a visit. The caregiver’s demeanor and spirit lifted as if a burden was removed from her shoulders knowing that she would have an hour or two with a friend to sit and enjoy a cup of tea and feel not so alone. As quickly as her smile appeared, though, it faded away as she shared with her friend that her loved one was not responding to conversation anymore. Her joy and soul were crushed, and her heart was broken. It was painfully obvious that her friend decided not to come by … and equally obvious that she felt abandoned. It’s not always easy to know what to say to our friends who are caring for their dying loved ones. It’s easier (for us) to avoid the situation by offering excuses like “I don’t want to remember her this way” or “I can’t watch him like this.” Family caregivers do not have the luxury of avoidance. I believe this avoidance is typically caused by fear. Fear of not knowing what to say. Fear in not knowing what to do. Fear in recognizing our own mortality in the face of our friend’s dying loved one. Fear in upsetting our friend with the “wrong” words or by reminiscing occasions spent with their loved one. We don’t need to know the “right” words. Sometimes we don’t need to say anything at all. It’s so important to just be there for our friends as they provide care for a beloved family member. Sometimes they just need their hand held or a strong, supportive hug. Sometimes they just need our presence to share a cup of tea or a simple meal, or to bring them a bag of groceries, or pick up something at the drug store. We don’t need to be armed with clever sayings or big gestures. We need to just be able to sit with them, let them share their experiences, and listen. We need to … just be. This entry was posted in Family Caregiving on September 4, 2016 by Cindy Moyer. People frequently say: “I don’t want to be a burden to my family.” And yet without conversations, planning and guidance, that’s exactly what we may become to them. A loved one’s involvement through the end of life experience, especially having decision-making responsibilities, can greatly impact how they cope through their grief and bereavement. If they feel guilt and remorse over making decisions, they’re likely to feel guilt, maybe resentment, through their bereavement. If they have the benefit of knowing our values, beliefs and decisions, the emotional burden of decision-making is decreased and bereavement is likely to be less fraught with negative emotions. Below is our illustration of the general concept of how we experience grief with the actual “closer to the truth” experience of grief. Some assume that the deepest grief is felt immediately at the loss (as indicated by the darker shade of the line). As time passes, and we move away from the moment of loss, the shade of the line grows lighter – so does, supposedly, the depth of our grieving feelings. 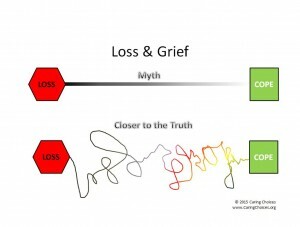 In reality, grief and bereavement have a less-defined trajectory as illustrated in the second “line”. Grief is different for each individual, as it is for each situation, whether it be death, divorce, loss of job, loss of independence, etc. One size does not fit all. There is a method of coping with grief that may seem absurd. Yet, it can be helpful when you’re ready to consider it. The notion is that of gratitude and creating a Gratitude List. Not, of course, that you’re grateful for the loss (death, divorce, loss of job, loss of independence, etc.) BUT that you are able to see how the loss transformed your life in a positive way. I’ve written before about the year I turned 30: One month after my 30th birthday, my Dad died unexpectedly. Four months later, I was filing for divorce and leaving my home with my then 8-year-old son to move back in with my Mom. At that time, I could only focus on the enormity of the losses. We were able to support each other through the loss of Dad. I was able to be Mom’s primary caregiver through her final years of life. I learned a lot about family caregiving that influences my life and work today. We learned first-hand the benefits of Hospice care. My son had the benefit of living with his Grammie for five years. We had the benefit of being prepared for Mom’s death because we had time together to talk. I’ve added to my Gratitude List with other losses over the past 22 years (that’s how long my Dad is gone). Some might say this is simply finding the silver lining in each cloud but I believe it’s more than that. It’s not just positive thinking or reflection. It’s about recognizing and accepting positive changes in your life when really awful things have happened. There is a research group at UNC Charlotte who works on this topic, which they termed “post-traumatic growth”. When you’re ready, check them out. Caring Choices understands that loss is inevitable for most of us. Falling into the depths of despair because of loss can be lessened. We have the power to prepare people we love for loss which can allow them to eventually make their own Gratitude List. It starts with communication. We can help. This entry was posted in Advance Care Planning, Family Caregiving, Personal Stories on October 10, 2015 by Cindy Moyer. Initially, a line in the sand is drawn to signify a point at which no one will cross. But once water flows over the sand (change! ), the line blurs or outright disappears. Then, it becomes time to re-evaluate and draw a new line. An interesting fact about effective advance care planning (ACP) is that it’s never a once-and-done act. It demands multiple conversations, oodles of information, shared decision-making, and the ability to plan for, and evaluate, changes as they occur. Hence, the line in the sand metaphor. Let’s say you’re a healthy 60-year-old man involved in a motor vehicle accident who now requires a feeding tube for a brief period until you’re able to eat normally again. And maybe you also had your hip replaced because it was broken in the accident. So, now you also need a short term rehab stay in a nursing home for therapy with your new hip. In this case, you might change your “nevers” to allow your family to insert the feeding tube for this (expectedly) brief time and you’re okay with a nursing home rehab stay. So, you move your line in the sand. Advance 20 years and you’re now an 80-year-old man with Parkinson’s Disease and fast-advancing dementia. You live in your 2-story home with your wife of 50 years and she’s been your primary caregiver. You are dependent on your wife for all of your care but she’s frail herself now and unable to move/lift you as she once did. And now you can no longer safely swallow food or drink. 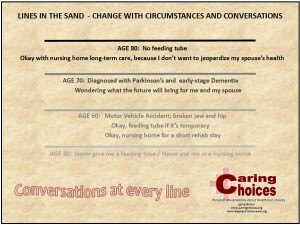 Where is your line in the sand now about a feeding tube or nursing home placement? The person with dementia [added by Cindy: end-stage heart failure, end-stage lung disease, cancer, aphasia, fill-in-the-blank disease] cannot participate. Families already burdened by caregiving may disagree about care options. Despite the nature of the disease, death may occur suddenly and without warning. I’ll let you decide the correct response. People may believe this line-in-the-sand approach to conversations about healthcare options indicates that we should wait until we reach a certain age or health condition and THEN decide where to draw our line. Perhaps some believe that deciding at age 30, 40 or 50 what I want when I’m 70, 80, or 90 is impractical. Things change rapidly in today’s medical arena so maybe in another 20-30 years I won’t have to worry about a feeding tube or nursing home placement because they’ll be able to fix whatever is wrong with me and I’ll be good as new. Except we know that the aging process changes our bodies in ways that are not always readily apparent and changes in health can be swift and unrelenting. We know that heredity gives us increased risk factors and predisposition to certain diseases that we are likely unable to change. We know that chronic illnesses (including cancers) take their toll eventually on all those who live with these diseases. We know that illnesses like ALS, Parkinson’s, and Dementia are progressive and irreversible. We know that every person alive will die. Talking about how our health will change as we age and as diseases occur will not make either of them happen faster than nature occurs. Talking about the types of care we don’t want will not diminish the types of care we choose. Talking about dying and death will not hasten death’s approach at our doorstep. Talking earlier however, WILL prepare you and the people around you (loved ones, caregivers, healthcare providers, employers, co-workers, etc.). It will prepare you to draw lines in the sand and then re-draw them as conditions/ideals/values change. It will prepare you to say and do things that are important to you now. It will give you the opportunity to help prepare those who will grieve your death. It will prepare those who survive you to embrace their grief as a natural part of life, wrapped in the knowledge that you loved them, you’ll miss them and that you expect them to go on with their lives (and that it’s okay to do so). Caring Choices helps you draw that first broad line in the sand and then define or move the line as age increases and health declines. We can give you and your family tools to start the conversations to share decisions that will help survivors after you’re gone. Don’t deprive your loved ones of peace after your death. Draw a line in the sand now, knowing that you have the option to move it as often as needed. Talk. Now and often – until you can no longer do so. This entry was posted in Advance Care Planning, Family Caregiving on September 19, 2015 by Cindy Moyer. It seems everywhere you turn there’s a sign showing us the way, urging caution, providing information, enticing a purchase, warning of danger, or providing some of other kind of assistance/information. 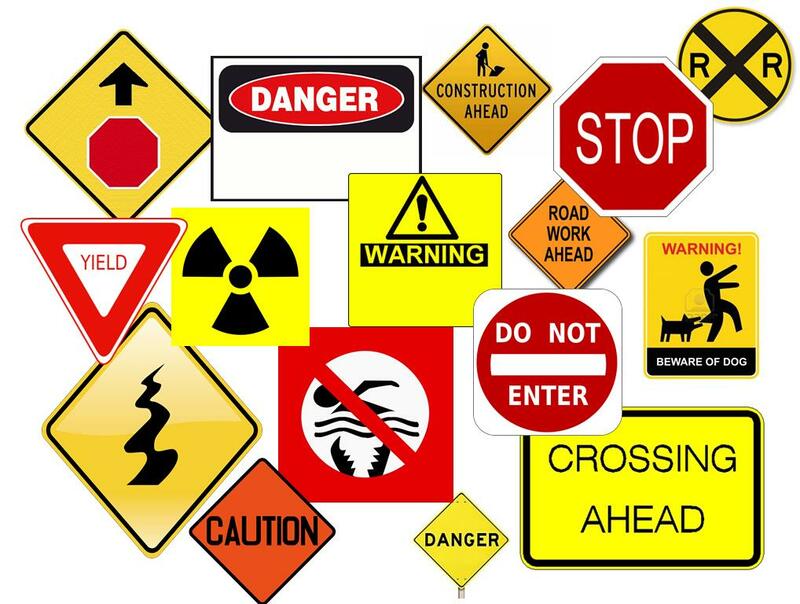 Most signs that command attention are in red or yellow providing warnings or cautions leading us to adjust preparations, choose another path or proceed cautiously. Most of these signs are blatantly obvious, in our faces and difficult to ignore. Some are downright unsafe to ignore. When you’re on the road, a detour sign forces you to change course. 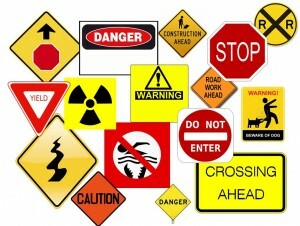 Caution signs alert to an upcoming challenge or danger and one must react accordingly to protect yourself and others. There are many signs in life, however, whose meanings are not so obviously apparent or easily followed. There are subtle signs which can be misinterpreted, easily ignored, or dismissed. The signs most difficult to recognize and follow are the signs our own bodies present when the end is nearing. As I read through the booklet after Mom died, hindsight illuminated other subtle signs that Mom’s body had been showing us for the last year of her life. Fortunately, Mom knew her body well through the lifelong course of her specific disease. She recognized the signs each time she had pneumonia before the doctors and hospitals ran the necessary tests to confirm it. She wasn’t afraid to talk about the changes she felt and where those changes were leading. She talked about death because she lived with the specter of it all her life; she understood her prognosis and what would likely claim her life. This doesn’t mean she didn’t LIVE life and enjoy it. She did. We did. And on the day of her death, I knew what she wanted and didn’t want. I could recognize and interpret the signs because that booklet and my Mom had prepared me to accept the signs. It changed my grief experience because I didn’t feel guilt or remorse for making a “wrong” decision. I followed the signs. Caring Choices is available to help you recognize the signs, talk about the signs, and follow the signs. Blatant or subtle, signs are intended to help us. Knowing what the signs mean can help us make decisions to benefit the people we love. This entry was posted in Family Caregiving, Personal Stories on August 2, 2015 by Cindy Moyer. Medicare recently announced that it would implement paying physicians for taking the time to have advance care planning conversations with their patients beginning in January 2016. This could have happened in 2009 but certain politicos and pundits warped the intention of this into “death panels” which knocked these important conversations off the table. Now that Medicare will reimburse physicians to have these conversations, I can’t help but wonder about the metrics and outcomes measurements that will also be implemented to track the occurrences of these conversations, as well as their efficacy. It seems like a step in the right direction to reimburse physicians for the time they spend in these conversations with their patients. These conversations can provide important information for doctors, nurses, social workers, etc. about what their patients want as far as treatment, pain and symptom management, and end of life care. However, the majority of “care” that patients receive may not be provided by their doctor (oncologist, cardiologist, primary care doctor) or the nurses, social workers and psychologists who work inside the healthcare facility. Medicare’s decision to reimburse physicians for their time may encourage more physicians to take the time to talk with their patients in more depth than time has so far allowed. Physicians and other healthcare providers certainly have a role in discussing risk vs. benefit of treatments, rates of survival, efficacy of drugs, places to receive care, etc. This reimbursement will probably not entice physicians already reluctant to talk about “care vs. cure”. It will not instill the comfort and confidence needed to have these kinds of conversations with patients in some physicians who have not found that comfort and confidence already in their approach. A conversation in a healthcare setting is only a beginning of much needed consistent and continuing conversations to help a patient and his/her family through chronic illness management and decisions. Physician-led conversations will likely not be as frequent (or appropriate) in the midst of a medical crisis, accident or trauma. Conversations must occur long before these situations happen. There must be more to these conversations than medical considerations. I continue to believe that the most important aspect of care conversations is the information shared among family and friends who will be the in-home caregivers providing the majority of care. Family and friends who will serve in the role of surrogate decision-maker when the patient is no longer able to make decisions or needs known will reap the benefit of these conversations. There are rare instances where financial reimbursement is available for the time family and friends will spend in caring for a loved one. But when care choices are discussed and prepared for, those experiences can be priceless. What gives your life purpose or meaning? Where do you want to be cared for at the end of your life? If you were suddenly unable to communicate, would your family know what kinds of care you want (or don’t want)? This entry was posted in Advance Care Planning, Family Caregiving, News/Commentary, Resources on July 19, 2015 by Cindy Moyer.